All papers are available in PDF format on the ACL Anthology. A copy of the proceedings is also available from this website, or you can download the full proceedings volume in PDF. 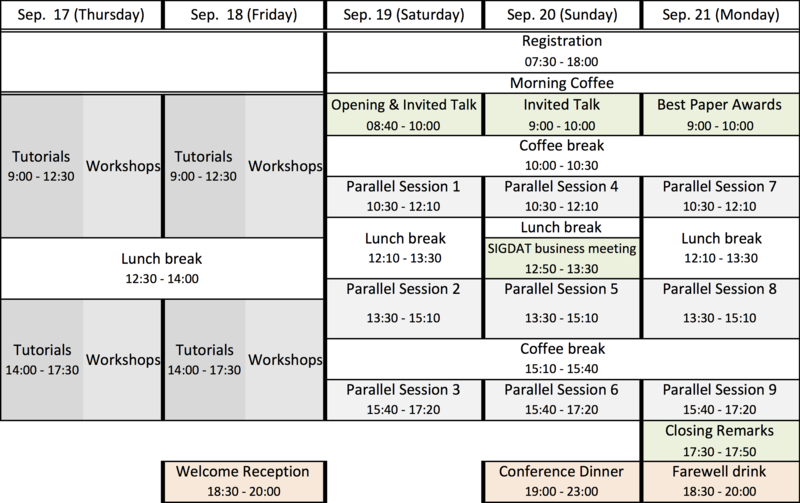 The conference program for EMNLP 2015 will also available from within the Conference4me application for your mobile phone. Indicative Tweet Generation: An Extractive Summarization Problem? Noise or additional information? Leveraging crowdsource annotation item agreement for natural language tasks. 16:30–16:55 [TACL] It’s All Fun and Games until Someone Annotates: Video Games with a Purpose for Linguistic Annotation. 10:30–10:55 How Much Information Does a Human Translator Add to the Original? 10:30–10:55 Do Multi-Sense Embeddings Improve Natural Language Understanding? 14:45–15:00 Talking to the crowd: What do people react to in online discussions? 15:40–16:05 When Are Tree Structures Necessary for Deep Learning of Representations?